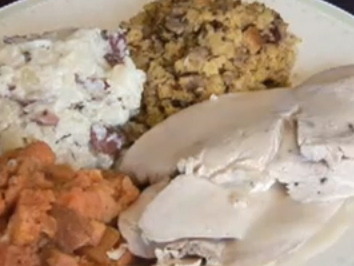 Did you know that this Thanksgiving, you’re likely to consume over 4500 calories?! Don’t freak just yet. Let’s break it down. A 6 oz. serving of Roasted Turkey (Dark + White Meat, Untrimmed) has as many as 450 calories. A 1/2 cup of gravy will add flavor but also almost 178 calories. TIP #1: Don’t eat the Turkey skin, and stick to white meat. TIP #2: Use store bought gravy instead of the homemade kind, it generally has less fat and calories. A half cup of cranberry sauce has 209 calories. Mashed potatoes made with whole milk and butter will add 238 calories per cup and homemade stuffing can total as many as 355 calories per cup. TIP #3: Moderation, ladies and gents. Use a smaller dinner plate and refuse to go up for seconds. Chances are you’re had enough appetizers to feel full. If you like this post, please consider recommending my blog to the Tumblr Directory. TIP #4: Instead of heaping on piles of mashed and stuffing, put a single spoon full of each and keep moving. For cranberry sauce, limit to about a 1-1.5 inch thick slice. Now add the candided sweet potatoes for an extra 355 calories for 3/4 of a cup. Green Bean Casserole for 3/4 cup contains 165 calories, 3/4 cup of glazed carrots for 217 calories, one dinner roll With 1/2 pat of butter scores an additional 125 calories. The current total is now 1920 Calories and we haven’t even mentioned dessert of alcoholic beverages. This may sound a little overwhelming so to help you understand I have brought you a visual. This video shows you what these typical servings look like. Now add 2 glasses of wine, 240 calories. A slice of Pecan Pie sadly has 456 calories. Lastly if you like eggnog, you’ll have to add 400 calories to cap it all off! Your new grand total is 3401 Calories! Did we mention we have not even touched appetizers, what you ate for breakfast or night time nibbles? TIP #5: Stick to wine if you must have alchohol. Have it with dinner, not before while you are snacking on appetizers. It will make impair your judgement for the main meal, and cause you to eat more than you would’ve liked. TIP #6: Pumpkin pie is your healthiest bet when it comes to dessert pies. Not an option? Use good judgement, drink lots of water to help fullness settle in and monitor potions. In order to burn all the calories, I would need to go for a 6 hours and 40 minute long jog! Yuck. Got 4 minutes? Before you just in the shower, try our my “Worlds Fastest Workout,” to get your metabolism going. You can burn up to 400 calories throughout the rest of the day. TIP #7. Have a light breakfast with protein and whole grains like scrambled eggs, turkey bacon with a piece of Ezekial bread and some peanut butter (or jam if you’re hungover. It will help you feel better I promise). TIP #8: Wear snug pants. TIP #10: Get moving by help cleaning up. TIP #11: Fill your plate first with the healthiest options. Add unhealthy side dishes like candied sweet potatoes last. TIP #12: Drink calorie free beverages. TIP #13: Plan ahead. Know what foods you never get to have and know you love, so you can splurge, eat lighter appetizers, and plan to have a light salad later if you’re hungry again later.